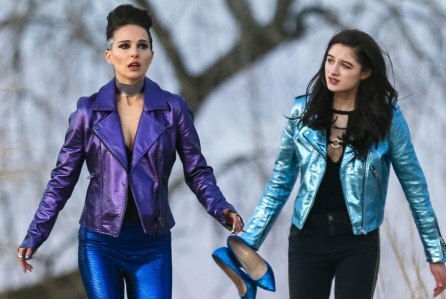 Written and directed by Brady Corbet from a story by Corbet and Mona Fastvold, Vox Lux is the story of a pop singer trying to get her career back on track while dealing her past that included her response to a school shooting that prompted her and her sister to write a song. The film is a study of a woman dealing with stardom and the craziness of it while trying to be a mother to a teenage daughter. Starring Natalie Portman, Jude Law, Stacy Martin, Raffey Cassidy, Jennifer Ehle, Christopher Abbott, and narration by Willem Dafoe. Vox Lux is a riveting yet haunting film from Brady Corbet. After surviving a school shooting that left her nearly paralyzed and force her to wear a neck brace for the rest of her life, a young girl writes a song with her sister in response to what happened as it would later make her into a pop star where she later struggles with the demands of stardom and motherhood as an adult. It’s a film that is essentially a character study of sorts that showcases this young woman who has been affected by tragedy as she tries to comprehend what had happened. Brady Corbet’s screenplay has an unusual structure in its study of Celeste Montgomery (Natalie Portman) from the time she was a teenage girl (Raffey Cassidy) who created a song with her older sister Eleanor (Stacy Martin) and then becoming a young pop star to being a major pop star who has become full of herself. The film’s narration by Willem Dafoe provide some context into what Celeste would deal with but also events that would cause trouble in making Celeste lose touch with aspects of reality. Even in the film’s second act where she’s an adult with a teenage daughter in Albertine (Raffey Cassidy) just as she’s about to release a new album and launch a new tour. Yet, there’s still a lot of issues that Celeste is dealing with while is becoming more problematic while being estranged towards her older sister who has been taking care of Albertine. All of the drama as well as chaos that surrounds Celeste forces her to say things through her music although scandals and her own actions are starting to overshadow the music at a time when branding and image becomes more important. Corbet’s direction is entrancing for his approach into telling the story of a young pop star’s life and her emergence into adulthood as it is shot on various locations with much of the film’s second half shot in New York City and nearby areas. While there are some wide shots of the locations and the film’s climatic concert sequence, much of Corbet’s direction emphasizes on medium shots and close-ups along with home movie video footage. The home movie footage that include Dafoe’s narration play into the innocence that the young Celeste and Eleanor endured where the former is to be signed with Eleanor on board as not just as a songwriter but also someone who is watching over the young Celeste. There’s a looseness to those moments in the home movie footage where the sisters travel to New York City and later Stockholm and London to make Celeste’s debut album with their manager (Jude Law) as it would later devolve into craziness. There are a lot of tracking shots and long-takes such as an early scene of the school shooting where it’s sudden and visceral in its execution. When the film shifts towards the second half as it is set more than 15 years after the events where the young Celeste is making her first album. The film does have a different tone where does feel more polished in its camera movements and compositions. Most notably a diner scene between Celeste and Albertine as they talk where the former goes off on the diner’s manager all because he politely asked for a picture. The climatic concert scene that includes choreography by Benjamin Millipied is definitely extravagant yet it also play into this persona that Celeste has created as a way to escape from the horrors of the world despite the fact that she is indirectly connected to a recent event of violence. Still, it does reinforce the role of the pop singer and how they use music to heal despite their own flaws and artificial world they live in. Overall, Corbet crafts an evocative yet harrowing film about the tumultuous life of a pop singer. Cinematographer Lol Crawley does excellent work with the film’s cinematography as it is largely straightforward in terms of the visuals with some unique lighting for some of the interiors as well as the film’s climatic concert scene. Editor Matthew Hannam does fantastic work with the editing as it utilizes a few jump-cuts and montages with the latter for the home movie footage. Production designer Sam Lisenco, with set decorators Kendall Anderson and Olivia Peebles plus art director Julia Heymans, does brilliant work with the look of Celeste’s stage set as well as the scenes in the school and at Stockholm such as the recording studio and hotel rooms. Costume designer Keri Langerman does amazing work with the look of the clothes that the adult Celeste would wear that would play into this larger-than-life persona as well as be this idea of cool while everyone else looks a bit casual with Albertine sort of dressed up as a Goth. Visual effects supervisor Asaf Yeger does nice work with some of the visual effects as it’s mainly set-dressing for some parts of the film including exteriors of 2000-2001 NYC. Sound designer Leslie Shatz does superb work with the sound in creating some effective sound mixes such as the sounds of gunshots as well as how music sounds in a venue or the atmosphere of a hotel room. The film’s music by Scott Walker is wonderful for its usage of ambient and classical-based pieces that help play into the drama while the original songs by Sia are effective and catchy as its approach to electro-pop have something that is engaging with the rest of the music soundtrack by music supervisor Margaret Yen include a couple of tracks by Sunrise in the Desert. The casting by Cassandra Kulukundis is incredible as it feature some notable small roles from Matt Servitto and Meg Gibson as Celeste and Eleanor’s parents, Maria Dizzia as Celeste’s music teacher early in the film, Daniel London as a preacher early in the film, Leslie Silva as Celeste’s stylist, Micheal Richardson as a musician the young Celeste meets in Europe, and Christopher Abbott as a journalist who interviews the older Celeste and eventually piss her off. Jennifer Ehle is fantastic as Celeste’s publicist Josie who is trying to ensure Celeste’s career is going well as well as being realistic to the point that she is also protective of her during the latter parts of Celeste’s career. Jude Law is excellent as Celeste’s manager as a man who would handle the business aspects of Celeste’s career but also try and get her to be reasonable later on while he would unknowingly help cause the rift between Celeste and Eleanor. Stacy Martin is brilliant as Eleanor as Celeste’s older sister who would be her collaborator in writing the songs they create as well as introduce her to all sorts of things that would later play into their rift with Martin displaying a restraint as someone who feels mistreated by the person she’s caring for. Raffey Cassidy is great in a dual role as the young Celeste and Celeste’s daughter Albertine where Cassidy displays an innocence and charm as the younger Celeste who is also aware of what happened to her and the need to connect which would be something Cassidy would delve into as Albertine as a young girl trying to understand her mother’s state of mind. Finally, there’s Natalie Portman in a spectacular performance as the older Celeste Montgomery as a pop star that is trying to make a comeback with a new album and tour where Portman is unleashed in displaying someone who can really bitchy and mean but also someone who is quite fragile as she needs to escape from the realities of celebrity by just singing as it’s a tour-de-force performance from Portman. Vox Lux is a sensational film from Brady Corbet that features tremendous performances from Natalie Portman and Raffey Cassidy. Along with its supporting cast, study of trauma and escape, and an incredible music soundtrack from Scott Walker and Sia. It’s a film that explore the mind-set of a pop star who has been affected by tragedy forcing her to create a bubble that disconnects itself with reality with music being her saving grace. In the end, Vox Lux is a phenomenal film from Brady Corbet. I've wondered about this thing. It does seem to be flying under the radar a bit. I do hope to give it a look. I really hope my theater gets this but I doubt it will. I'm intrigued by Brady directing, I was wondering where he went. Great review! @keith71_98-Yeah, it was at my local multiplex as I knew I had to see it right away as films like this go away after a week. It's worth seeking out. @Brittani-See it as soon as possible. I was lucky it got played at my local multiplex. Corbet's been making films as a director a while and he's been living mainly in Europe. I like to see what else he's been doing.